SFGAM_Hog wrote: I wish they would redo that entire area tbh. I honestly hate that entire wacky theme going on with Kidzoplis and the tent frame that is still there. The entrance and walkway to AE is ugly. They should get rid of all of that concrete walkway with the sky coaster platform in my opinion. Have the Eagle's queue line start ground level and then have stairs right by the service road and train crossing. How about retheming the kids area and adding in a thrilling flat ground level where the sky coaster is. I've wanted this for a long time but sadly we might never see this. If Eagle really did get an RMC, Kidzopolis got rethemed to Bugs Bunny Boom Town, and the entrance/queue got a complete overhaul it would be a personal dream. Even if Eagle did avoid the RMC I would still love to see improvements to it. Since Eagle first opened, it's always felt like it wasn't part of the park proper because of its queue. I also would like to see this improved. And yes, as long as they're at it, improve the Kidzopolis layout as well. Maybe push the Krazy Kars track behind Johnny Rockets. This would open up a contiguous area of land if they ever decided to lose Dare Devil Dive. Goku1910 wrote: Even if Eagle did avoid the RMC I would still love to see improvements to it. In Marcus Leshock's new podcast someone posted here earlier, he talked about Worlds of Fun in Kansas City bringing in GCI to retrack their two wooden coasters. It would be great to see AE get retracked. Maybe it will one day. It's not getting RMC'd, I highly doubt it. Also, I haven't heard of that rumor RMC is working to repair AE. I personally would like Eagle to get the GCI refurb...I mean just look at Ghost Rider at Knott's. jmanporty7 wrote: I personally would like Eagle to get the GCI refurb...I mean just look at Ghost Rider at Knott's. I know!! I wonder if the park would actually do this or take out another loved flat for a skywarp. gottastrata33 wrote: You know what I see happening.... the land against Maxx is going to be used for HH at some point. It’s a small plot but enough to add a little somethin. SFGAM_Hog wrote: I don't think so. The land between Maxx and the HH path is too small. You also have the train tracks going through that entire area too. I don't know how the queue will lay, but there's a hill there still behind Carousel Gifts. I'd love for a flat to go there, but I just don't see it happening. It's bigger than you think. The area between the train curve, viper, and HH is quite large. If they manage to move that electrical building and then pushed HH's entrance back they could fit something small there or expand upon Riptide Bay. This may not be for 2020, but I could see something as large as a Proslide RocketBlast/Flying Saucer water coaster going next to Maxx Force eventually. If they can't move the electrical building, they could always go over or around it with a water slide. 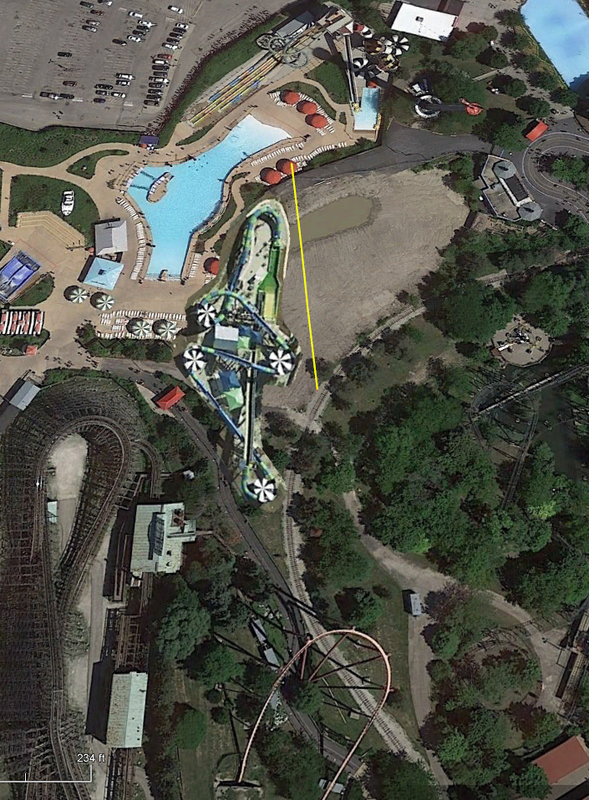 The yellow line in the image below marks approximately where I think the undeveloped land next to Maxx Force begins. The water coaster at Fiesta Texas is now more efficient due to a new water nozzle design.